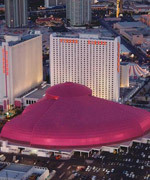 Book your stay now and receive up to 40% off rooms on the Las Vegas Strip! Plus you'll receive over $150 in coupon savings for dining, retail outlets, The Adventuredome and more! The Adventuredome is 5 acres of fun with 25 rides and attractions including El Loco, where you will experience twists, turns and drops in a very unique coaster as you ascend 90 feet before dropping over and under to experience a 1.5 vertical-G. It’s the fun you remember, the Circus you won’t forget! Save $10/night by Booking Online. Reservations made by phone are subject to higher rate. A daily resort fee will be added to your room account, which includes select hotel amenities. The first night's deposit is fully refundable provided notice of cancellation is received by Room Reservations at least 72 hours prior to arrival. While certain room requests and locations cannot be guaranteed, a sincere effort will be made to accommodate your needs. Room rates are based on single or double occupancy. Additional guest charges will apply. There is a maximum 4 guests per room. Guests must be at least 21 years of age to check in. Offers are subject to promotional availability; blackout dates apply, and are not available to groups or persons attending meetings or conventions. Offer is nontransferable and may not be used in conjunction with any other promotion. Management reserves the right to cancel or change this promotion at its discretion without prior notice. Nightly rates are 10% commissionable to valid IATA, ARC, CLIA, and TRUE/OSSN travel agency. MGM Resorts International offers GameSense information to its patrons to encourage responsible gaming at mgmresorts.com/gamesense (in MA at gamesensema.com). If you or someone you know has a gambling problem or concerns with gambling responsibly, please call the 24-hour Problem Gambler’s Helpline at 1.800.522.4700, or call 1.800.GAMBLER (in New Jersey and Maryland), 1.800.426.1234 (in Massachusetts) or 1.800.270.7117 (in Michigan). Or visit mdgamblinghelp.org (in MD) or masscompulsivegambling.org (in MA) for help. Please play responsibly. If you bet more than you can afford to lose, you’ve got a problem. ©2019 MGM Resorts International®. All rights reserved.